Mini introduces the Mini Cooper Monte Carlo: a super complete Mini Cooper S in honor of the 50th anniversary of Cooper S. In the early years of the Mini small fast crowd favorite won no less than three times the Rallye Monte Carlo. 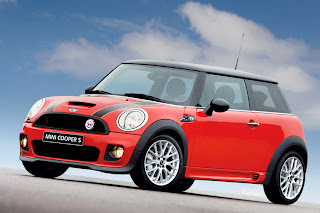 is only available as a Mini Cooper S Hatchback and notably equipped with the John Cooper Works Chili package containing a multifunctional John Cooper Works steering wheel, 17-inches cross spoke wheels, John Cooper Works body kit, front fog lights, rain and light sensor , automatic air-conditioning, white lights, sport button, Dynamic Traction Control and Xenon lighting. The package has the Mini both in-and exterior of the Mini John Cooper Works. Of course, this special edition of the Cooper S all the possibilities to stay connected with the outside world by Mini Connected, navigation, USB jack, voice control and a trip computer, called Wired package. With the victories of the Cooper S in Monte Carlo in mind, Mini - to make this version extra sporty and luxury - the following options have been added - black headlight reflectors, electric glass sliding/tilting roof, Recaro sports seats, park distance control, Harman Kardon speakers and heated front seats. The Mini Cooper Monte Carlo is identified by a 50 years badge on the grille of the car and side scuttles 50 years. As of July is available from the Mini dealers for a price of € 34,495, the Mini Cooper Monte Carlo - that means a price of more than 5,000 euros.